The first component of the “first artificial reef theme park in the Mexican Pacific” was put in place November 21, when the Uribe 121 was sunk off the coast of Rosarito, Baja California, Mexico, about 40 miles (64 km) south of San Diego. The 220-foot (67 m) former patrol boat was donated by the Mexican Navy and is the first of four attractions that will compose Rosarito Underwater Park, located a little more than a mile (1.6 km) from shore. The Uribe 121 now rests in 90 feet (27 m) of water. Supporters hope the Uribe 121 will provide an economic boost for the Rosarito region, attracting divers to the area to dive, eat, shop and stay in local hotels. In the first year alone, nearly 40,000 divers are expected, according to some estimates. When completed, the underwater park will consist of five parts: a ship cemetery, “Mesoamerican Atlantis,” Titanic tribute and sculpture garden. A topside museum will account for the fifth component. The ship cemetery, where the Uribe 121 now rests, is dedicated to shipwrecks and provides habitat for marine life. The “Mesoamerican Atlantis” is an exploration zone featuring replicas of pieces made by early inhabitants of the area, including the Toltecs, Mayans and Aztecs. The Titanic area is included because Rosarito is where the famous movie of the same name was filmed. It will include a tribute to director James Cameron and reproductions of the “unsinkable” Titanic. The sculpture garden will showcase underwater art. In the museum, visitors will be able to see through a monitoring center what is happening under the surface. The plans are the brainchild of Francisco Ussel, an engineer who hopes to build dive tourism in the region, provide habitat for marine life to reproduce, and establish an area for scientists to study, with involvement from the Ensenada Scientific Research and Higher Education Center. The ship itself was part of the first Mexican fleet that could operate with MBB Bo helicopters on board. The vessel was named after Virgilio Uribe, who died in 1914 defending Veracruz. Rosarito is one of five cities in Baja California, and is a 15- to 20-minute drive from San Diego, via Tijuana. The park is a join project that includes the Mexican Navy, the government of Baja California, the Rosarito City Council, and the Baja California Association of Divers. 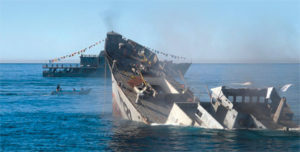 To watch video of the sinking, go to facebook.com/URIBE121/. For more information, go to rosaritounderwaterpark.com.